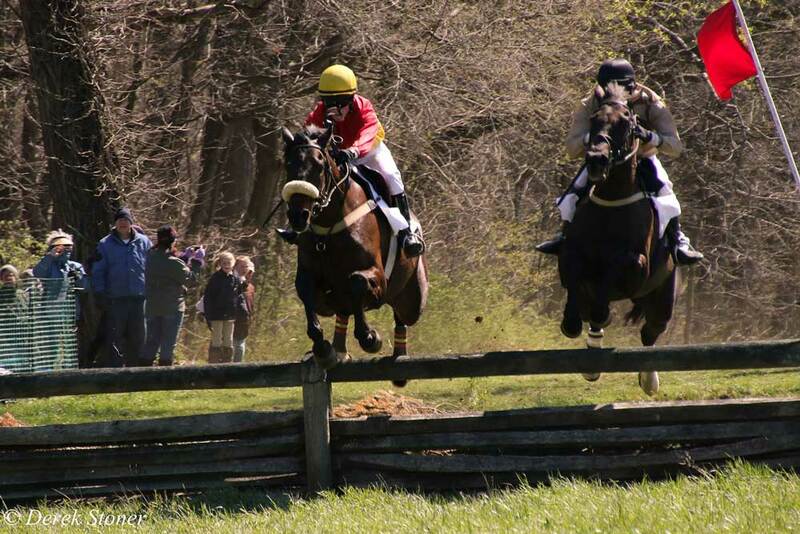 The Brandywine Hills Point to Point race. Without a doubt, the Brandywine Valley has established a reputation for being horse country. It is an area with many horse farms and an annual calendar filled with equestrian events. Year after year, the local equestrian schedule features an array of top-flight horse shows, dressage events, Grand Prix events and point-to-point races. The 2018 season will shift into gear this weekend with the 76th Annual Brandywine Hills Point-To-Point Races, which will be held April 1 on the grounds of the Brandywine Valley Association’s 318-acre Myrick Conservation Center (1760 Unionville-Wawaset Road, Unionville, 610-793-1090, www.brandywinewatershed.org). Gates will open at 10 a.m. with children’s activities such as “Pennies in the Hay”, face painting and stick. The steeplechase racing event features a challenging three-mile course with 17 timber jumps. The competition will begin at 11:30 a.m. with the Small Pony Race. the Medium Pony Race will be next followed by the Large Pony Race, the Lead Line Pony Race and the Radnor Hunt Foxhound Parade. The competition will continue with the Ladies Race at 12:45 p.m. The Heavyweight Race is scheduled for 1:15 p.m. followed by the Novice Race and the Open Race. The final competition will be the Owner-Drive Foxhunter’s Race at 2:45 p.m. This weekend, walk carefully so that you don’t accidentally step on an Easter Eggs. 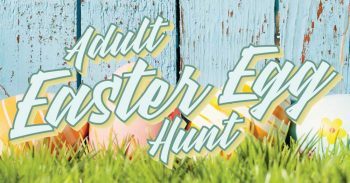 It might take some extra attention because there will be Easter Egg hunts everywhere – from huge hunts presented by organizations and churches to small family backyard hunts. One thing for sure — there will be a lot more hard-boiled eggs hidden and found than colorful eggs eaten. However, eating will be an attraction at several area holiday events this weekend. There are several top-caliber Easter events in the area including ones at Winterthur Museum, Garden & Library and Longwood Gardens. 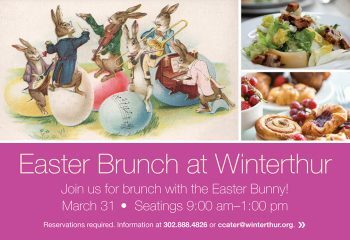 Winterthur Museum, Garden & Library (Route 52 just south of the Pennsylvania state line, Wilmington, Delaware, 800-448-3883, http://www.winterthur.org) will host “Easter Brunch with the Bunny” on March 31 and April 1 from 9 a.m.-1 p.m. both days. The Easter Bunny will make several appearances each day starting at 9 a.m.
Tickets are $35.95 per person with children (ages 2-12) at 50% off. Reservations can be made through ccater@winterthur.org or by leaving a message at 302.888.4826. 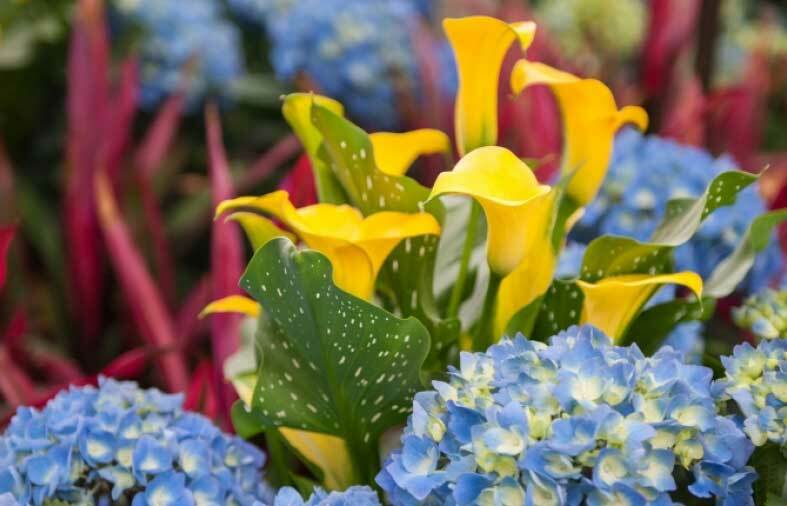 The Easter Buffet at Longwood Gardens (Route 1, Kennett Square, 610-388-1000, www.longwoodgardens.org) will present its “Gardens Ester Weekend” on march 31 and April 1 from 10 a.m.-4 p.m. both days. Live music will be presented in the Conservatory from noon-3 p.m. both days. Lunch will be served in Longwood’s 1906 restaurant from 11 a.m.-4 p.m. and will feature new Spring Lunch Menu as well as Easter specials. Another seasonal attraction at Longwood Gardens is “Spring Blooms,” which opened on March 31 and is running through May 6. Visitors can enjoy hundreds of lush acres featuring burgeoning gardens of daffodils, tulips, magnolias, azaleas, flowering cherries and more than 240,000 flowering bulbs. 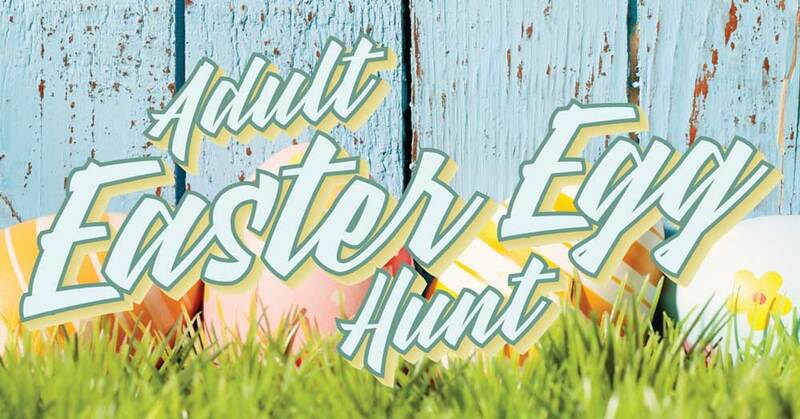 Based on the premise that kids shouldn’t be the only ones to have fun at Easter, the winery is inviting visitors to embrace their “inner child” and partake in an exciting “Adults Only” Easter Egg Hunt. Participants will scour the Winery grounds in search of hidden Easter eggs containing a wide array of treats such as Easter candy, bottles of wine, tickets to future Chaddsford Winery events, free wine tastings, gifts, coupons towards wine purchases, vouchers for Chaddsford gear (scarves, tee shirts), and glasses of wine. The hunts will be held at 10 a.m., noon, 2 and 4 p.m. and all participants are guaranteed to win at least one prize. 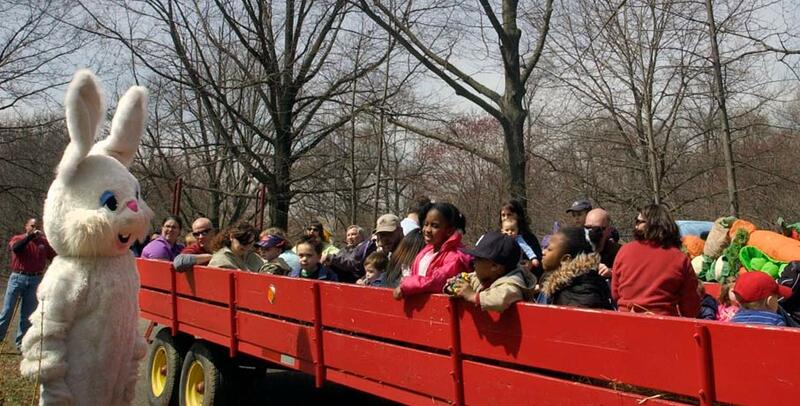 On March 30 and 31, there will be a special event called “Hayrides to Bunnyland” at Linvilla Orchards (137 West Knowlton Road, Media, 610-876-7116, www.linvilla.com). 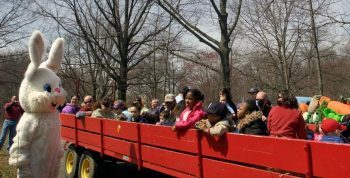 Highland Orchards (1000 Marshallton-Thorndale Road, West Chester, www.highlandorchards.net) is presenting “Hayrides to Easter Bunny” on March 30 and 31 from 11 a.m.-3 p.m. each day. There are times when the Easter Bunny wants to chill a little bit. So, instead of hopping around or joining in on a hayride, he rides a train. This weekend, the big holiday rabbit will be riding trains all around the area. The Easter Bunny will be down in Delaware for trips on the Wilmington and Western Railroad (Greenbank Station, 2201 Newport-Gap Pike, Wilmington, Delaware, 302-998-1930, www.wwrr.com) on March 31. On the special trains, the big bunny with the big ears will visit with all passengers and pose for pictures. Departure times are 12:30 and 2:30 p.m. and fares are $19 for adults, $18 for seniors (ages 60 and older) and $17 for children (ages 2-12). As an added attraction, every child on the excursion trains will receive a special treat from the Easter Bunny. At the Strasburg Rail Road (Rt. 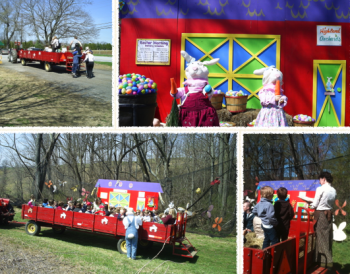 741 East, Strasburg, 717-687-7522, www.strasburgrailroad.com), the special Easter Bunny Train will be chugging down the tracks on March 30 and 31 and April 1 with departures starting at 11 a.m. each day. 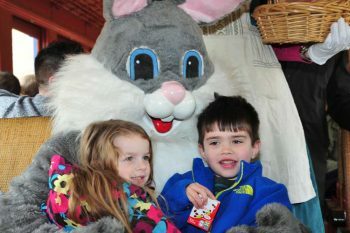 The New Hope and Ivyland Railroad (32 West Bridge Street, New Hope, 215-862-2332, www.newhoperailroad.com) is running its annual Easter Bunny Express now through April 1 with departures at 11 a.m., noon, 1,2,3 and 4 p.m. each day. The Easter Bunny is going to ride onboard the train where he will visit with each child, hand out special treats and pose for pictures. Coach tickets are $33.99 for adults, $31.99 for children (ages 12-plus) and $9.99 for toddlers (under 2). 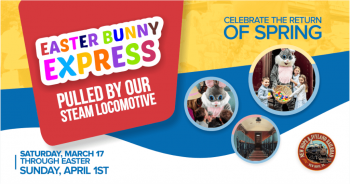 The Middletown & Hummelstown Railroad (717-944-4435, www.mhrailroad.com) will be running its Easter Bunny Express on March 30 at 1:30 p.m. and March 31 at 11 a.m. and 1:30 p.m.
Fares for the ride are $17 (ages 12 and older), $13 (ages 2-11) and $4 (under age 2 and on lap). The Easter Bunny will have a special present for all kid riders. An always-popular annual Easter tradition is the Easter Parade on South Street in Philadelphia (www.southstreet.com). 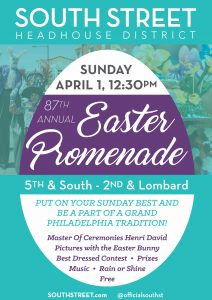 This year, the 87th Annual Philadelphia Easter Promenade will be held on April 1 from 12:30-2 p.m. The event will feature Mr. and Mrs. Peter Cottontail, the Easter Bunny and the Philadelphia Freedom band as well as contests for best-dressed children and adults and best Easter bonnet. Visitors are encouraged to come dressed in their “Sunday Best” and promenade down South Street in this grand and popular tradition. Master of Ceremonies Henri David is back to lead the parade from the corner of Passyunk Avenue/South Street down to Headhouse Square (Second Street) starting at 12:30 p.m. The popular annual event is free and open to the public. Not all special events this weekend deal with horses or bunnies. Fish also are on the schedule. 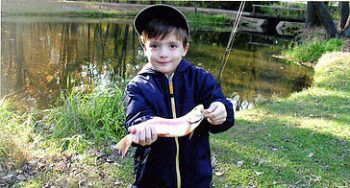 The trout fishing season opens at 8 a.m. on March 31 for all anglers in the 18 southeastern regional counties – including Berks, Bucks, Chester, Delaware, Lancaster, Lehigh, Montgomery, Philadelphia, and York. From March 31 through Labor Day, anglers may keep five trout — each at least seven inches long, per day. Newlin Grist Mill (219 South Cheyney Road, Glen Mills, 610-459-2359, www.newlingristmill.org) will celebrate “Trout Fishing Opening Day” from 10 a.m.-4 p.m. on March 31. The site has stocked its three ponds with trout and is ready for the arrival of the anglers. If you suffer from herpetophobia or ophidiophobia, then you better avoid of the exposition hall in Oaks this weekend or be prepared to suffer the consequences. Herpetophobia is the scientific name for “the fear of reptiles” while ophidiophobia means “the fear of snakes.” On March 31, the Greater Philadelphia Expo Center (100 Station Road, Oaks, 484-754-EXPO, http://www.eastcoastreptilesuperexpos.com/) will host the East Coast Reptile Super Expo featuring hundreds of live snakes and reptiles. The East Coast Reptile Super Expo, which is always a well-attended event, will run from 9 a.m.-4:30 p.m. this Saturday. Tickets are $10 with children (under five) admitted free. Many people think snakes and lizards are interesting creatures and maybe even fun pets to own. If you fall into this category, you should check out the show on Saturday. A wide array of reptiles will be on display as part of the popular exhibition, which is an annual event that is closing in on its silver anniversary. One of the show’s main attractions is a sales exhibit area featuring a large number of vendors with live reptiles, amphibians and arachnids as well as food items, supplies, books, cages, and related accessories. The roster of very diverse vendors includes AZO Reptiles, Rose’s Reptiles, Dale’s Bearded Dragons, Blake’s Exotic Reptiles, Dower Reptiles & Rodents, Reptile Kingdom, DHA Pythons, Gecko Haven, Hunger Reptiles, Jungle Emporium, Delaware Turtle, Just Lizards, Outback Reptiles, A-Bros Reptiles, Charm City Glam Charms, LLC, and Dragontown Reptiles. The list also includes RKZ Rodents, Monstar Reptiles, Turtle to Turtle, Delaware Valley Herpetarium, Newville Dragons, PM Herps, Black Jungle Terrarium Supply, VSCV Ventures LLC, Dachiu Dragons, Tom Rogan Reptiles, Native Exotics, Turtles & Terrapins, Venomous Addiction, and JJR’s Reptile Ranch. Other featured vendors will be Heath’s Frog Farm, Corralus Creations, Rogue Reptiles LLC, Jason R Bartolett Captive Bred Reptiles, Fowler Reptiles, Dragon Fortress, Turtle Towns, Garden State Tortoise LLC, Reptile Addicts, MCO Reptiles, A.M. Snakes, Twisted Genetics Pythons, and Perryman Dart Frogs. Circuses – the ones held with the traditional three rings – usually arrive in this area during the summer months. If you’re a circus fan and you’re already longing for a visit to the circus to see wild animals, jugglers, clowns and all the things brought by the circus, you’re in luck. You don’t have to wait until summer arrives. 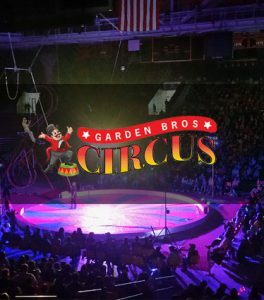 On April 2 and 3, the Garden Bros Circus will visit the area for a four-performance run at Gloucester County Dream Park Arena (400 Route 130, Logan Township, New Jersey, www.gardenbroscircus.com). The 2018 tour features an all-new Garden Bros Circus show. This year’s production is packed with breathtaking special effects, concert style lighting and three rings filled with excitement, laughter and memories that families will cherish. The circus has brought the very best performers from 18 countries to make a cast of more than 60 performers. Garden Bros Circus presents a fast-paced 90-minute show in a theatrical European three-ring setting. The list of performances includes the Human Pyramid, elephants, daring aerial artists, six motorcycles in the Sphere of Fear, the “Crazy Cossack Horse Riders,” Chinese acrobats, death-defying Trapeze, contortionists, clowns, and jugglers. Performance times are 4:30 and 7:30 each day. Ticket prices are $25 for adults and $10 for children (ages 3-13).